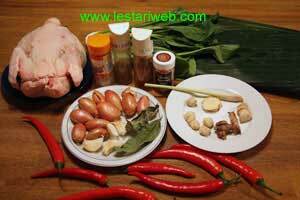 Botok is a typical dish which very popular in Central Java and East Java regions. There are many variations of Botok: Botok Tempeh, Botok Tahu, Botok Sembukan, Botok Kemangi, Botok Lamtoro etc.. One of my favourite that I have known since my childhood time is Botok Tempe Teri. 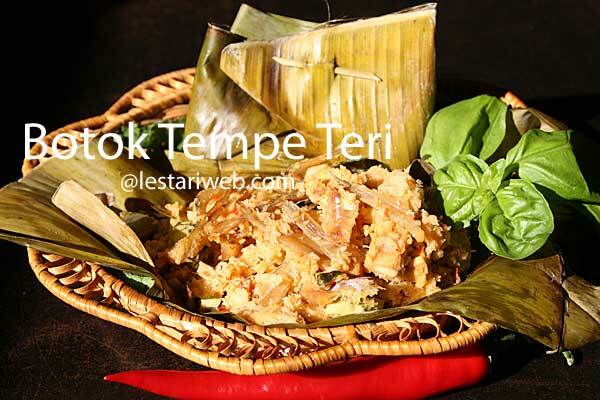 Tempeh which contains high protein, mixed with dried anchovies, freshly grated coconut spiced, then wrapped & steamed in banana leaves hhmmmm.......what a javanese culinary temptation !! Making a Botok is not difficult and complicated as you might think. Are you curious to try?? If you don't like dried Anchovy then just take it away. In this case your Botok will be a good choice for Vegetarians. Slice or cut the tempeh in small dice or matchsticks. Put together grated / desiccated coconut, tempeh, paste, dried anchovy and galingale in a large bowl. Mix well. If you used the desiccated coconut, add coconut milk and mix all the mixture once again. Adjust the seasoning. Add salt or sugar if necessary. Take 2 pcs banana leaves, stack to each other. Put 2-3 tbsp of the tempeh mixture in the middle of banana leaves. Add bay leaf on the top then wrap it properly. Steam it for 30 minutes since the steamer begins to sizzle until well cooked.